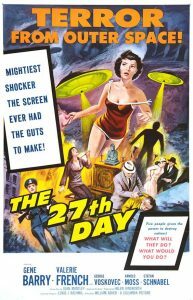 – “The 27th Day”. It’s premise immediately called to mind the plot for the the best film of it’s kind in the genre, “The Day The Earth Stood Still”. However, instead of offering the citizens of Earth an ultimatum as in the latter picture, ‘The 27th Day” gives five ordinary Earthlings from the world powers a device that has the potential to eradicate all of mankind. Right off the bat, one begins to wonder what in fact you might do yourself if given such a responsibility. One can’t miss the era’s anti-Communist propaganda theme in the course of the story, though the message seems a bit deeper than one might originally think. During the 1950’s, China was emerging as a world power, but was still largely ineffective in pushing it’s huge weight around; interestingly, the Chinese girl Su Tan opted to commit suicide rather than face the decision to deal with her device. Whereas the Russian private Ivan Godofsky reflected a willingness to die rather than reveal the secret of the doomsday device to his military superiors. It reinforced for me the idea that the vast majority of humanity would have no problem living peaceably together, except for their leaders who believe in the superiority of their nation or race. The movie points out how easy it is for reason, discipline and restraint to give way to fear, as people find it easy to fear most everything, not the least of which would be an alien threat of the outer space kind. The only thing I found to be rather troubling with the story was it’s resolution in the way it played out German Bechner’s (George Voskovec) mathematical interpretation of the alien capsules. The Soviet General is shown defeated and dying as a ‘confirmed enemy of freedom’, but just how the alien gizmo could fine tune it’s radar to locate individuals like that was way beyond the movie’s ability to explain adequately. I also got a kick out of Professor Bechner’s entreaty to the aliens at the end of the story from a seat at the United Nations; giving them fifteen seconds to respond from somewhere out in the far reaches of outer space. Geez, couldn’t he have allowed for atmospheric disturbances or some other technicality? Why not a full sixty seconds!! About the only recognizable name actor in the flick is “War of the Worlds” alumnus, Gene Barry. Remember that scene in the tavern with the English woman Eve Wingate (Valerie French)? There was a TV playing over the bar with a Western shootout on view; I’d like to think it was an episode of ‘Bat Masterson’, but that series came out the following year. In a different scene, Barry’s character Jonathan Clark got in a line to Eve about American rock n’ roll, calling it ‘music almost’.